I've spent the last few weeks feeling rather scared of child birth, realising that now, no matter what happens - there is no going back and it's going to hurt very very soon and there is nothing I can do about it! Strangely I'm more scared having baby number two than I was with my first, then it was all more exciting and I couldn't wait to meet my baby. This time I'm more scared of not being able to cope in childbirth, the pain and what I'm going to do with Bubba if I go into labour whilst we are alone. Every few days I break down in front of hubby and say I don't think I'll be able to cope with the pain. First time around I had a straight forward labour and birth, admittedly it was a long first stage labour which stretched over three days but on day four (after one sweep on day one) when I arrived at hospital I was 6cm dilated and continued to progress nicely until four hours into being in hospital I was ready to push and push and push...an hour later and minor tear, I had delivered a healthy and happy girl. 12 hours after that I was back home and dazed with a newborn. I've been having regular braxton hicks and also over a few days at week 37 some practice contractions and lower back pain. I was slightly taken aback by the pain and whilst in it I coped ok but afterwards I would fall apart slightly and dread the real thing. 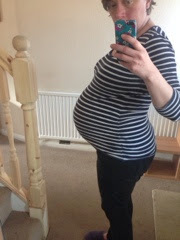 I'm going to mention my fears to the midwife but I've not really got it straight in my own mind what my biggest fear is. I regularly get conflicting emotions, all I know is that I don't want to think about it, I don't want to go into labour but I also want to try and have a natural birth again!